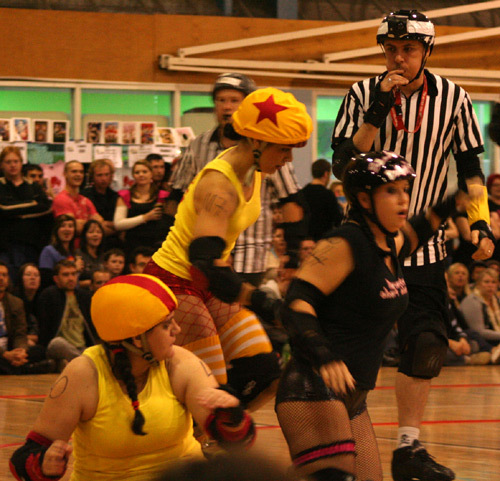 Roller derby is the resurgent women’s sport that involves skating around an oval rink, trying to prevent the opposite team’s jammer from overtaking you. Once popular as a spectator sport in post-war America, it disappeared for thirty years before undergoing a recent revival and is now growing fast — both here and in the U.S.
We first heard about roller derby several years ago through a locally-produced documentary Roller Derby Dolls. It seemed an interesting concept — but I didn’t give it much more thought until I saw that the local sports arena was hosting a match. Originally the sport was about violent contact — on wheels. But now the players dress up in fancy stockings, short shorts, lots of make-up and wear the full collection of protective gear. 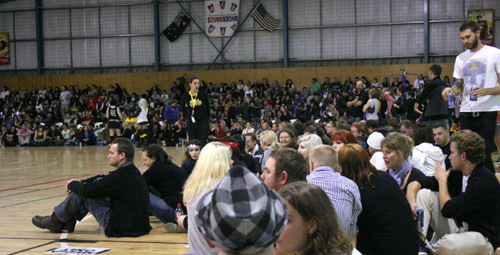 One of the peculiarities of modern roller derby is that the players appear under sinister pseudonyms. Last night we went with friends to see the Golden Roughs and the Liquorice Short Shorts play as part of the Sun State Roller Girls league. I had been warned in advance that it was popular, but driving to the venue, I was surprised when I started to see cars parked on the verges several hundred metres from the arena. The crowd attending was predominantly youthful (which just means younger than me), mostly wearing black, lots of make-up and some outrageous hair-dos. 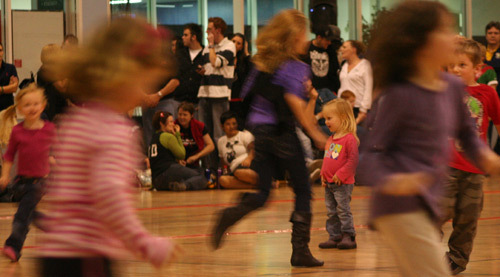 The roller derby bout was advertised as an all-ages event, so some families brought their children along (as we did). Inside the arena, chairs were set up in some locations around the rink, but most spectators sat on the floor in front of the chairs, several rows thick. 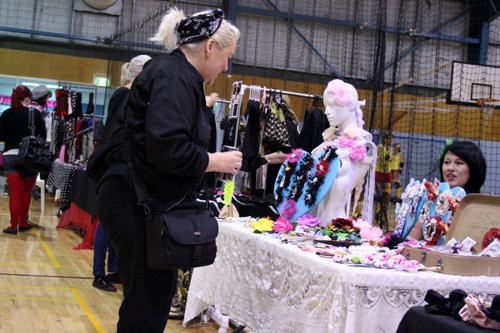 Across the back of the arena, rows of tables were set up selling ladies' fashion accessories, clothes and roller derby merchandise. We had been advised to get in early to mark out seats. As it was, arriving over an hour early wasn’t good enough to nab chairs, but we did find a bit of floor-room big enough to accommodate two families plus the two extras who tagged along. 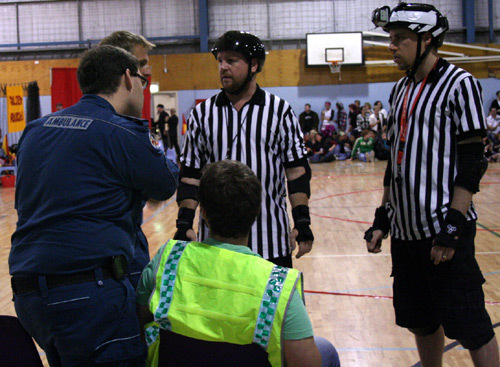 Before the game, the refs chatted with the paramedics. 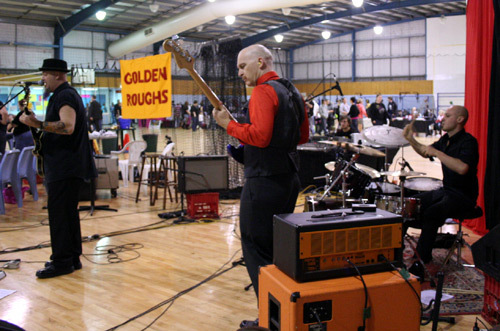 Music before the game and during half-time was provided by the unimpressive band "The Medicine Show". It took a long time for the game to start — over an hour — and that’s a pretty big wait for our little kids. I noticed that most of their stamina was used up in just waiting so that by the time the game started, they had almost lost interest in the whole event. Finally, after enduring the cover band, we were rewarded when the real show started. The referees and players were introduced and the ladies were formally checked to make sure they were wearing the full collection of protective gear. The game is about teamwork. 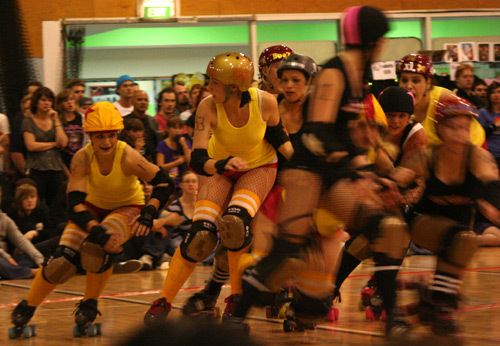 Each team's pivot (identifiable by the stripe on their helmet) sets the pace of the pack — and no pack player (except the jammer) can be further than 6 metres from the pack. The crowd cheers loudest when a player falls. Before they join the league, players have to pass a fitness test to demonstrate that they can (among other things) successfully jump over fallen players. Here you can see Golden Rough's jammer is coming up the outside left, scoring points for each member of the opposite team that she passes. At half-time, the children were encouraged to run around the rink. Calista just stood in the middle of it and watched the kids running around her. Thanks to all our friends who came along to share this new experience with us. It was great seeing you there! Your post reminded me of a CSI NY episode called “Jamalot” where a female roller derby dies during a game. After you left, sitting on the floor definetly became harder, but I started to get a bit more into the actual game. The teams were neck and neck, which added to the excitement for the kids. Would def go again if they had better seating, unfortunetly I think I am getting too old for sitting cross legged for 3 hours!! Here in the states the derby rinks are angled/curved, with rails to protect the spectators. Does this mean the US players get rougher? I wonder. 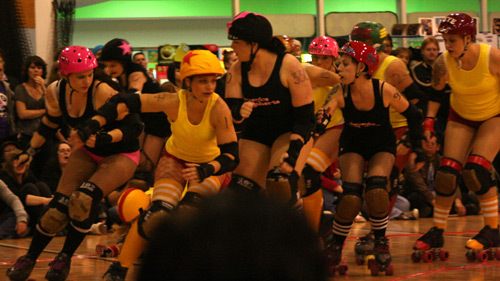 I’ve been wanting to attend an event, as roller derby is thriving in the Detroit area. We went to flat track too here in WA – loved it! Thanks for the comment on my blog! It’s nice to “meet” other moms in Christian Unschooling. Roller Derby looks fun… to watch! I have a friend at church who is really into it and the stories she posts! Yikes. But I used to roller skate as a kid and it was fun as long as I could stay on my feet.